That is correct. 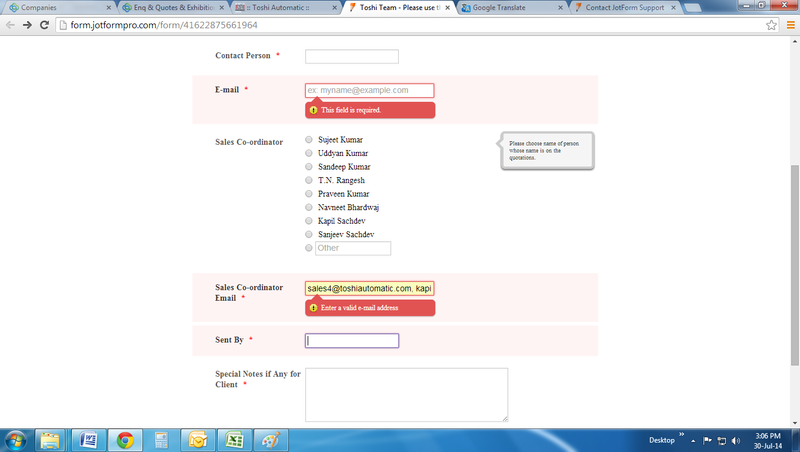 The Email field will NOT be able to accept multiple email addresses (separated by comma..) in the input box. The validation script will trigger error for this. OR use the TextArea field as the input field to allow multiple input.. the downside to this, the emails will not be validated if they are valid email address format. I too am having this issue. I have been adding multiple email addresses followed by a comma for the past 2 years. Now it doesn't seem to be working. Jotform, please make this work again. I've moved your question to a new thread http://www.jotform.com/answers/441567 and shall be addressed there. Would it be possible to use a widget to accomplish this? Possibly the Dynamic Textbox or Add Options? I'm assuming emails still won't be able to be validated, but at least it eliminates the possibility of people forgetting to add the comma. Edit: testing this out now. Trying to figure out a way to add the comma after each input field.. Any help on how to do this?? To better assist you, I went ahead and opened a separate thread for you. Please refer to this link instead: http://www.jotform.com/answers/699519. We will address it shortly.